Considerable interest appeared to be shown in the electric department, and especially by men who had been through the mill with either steam or gasoline or both. With increased knowledge of the properties of electric carriages more confidence is felt in their operation, provided the scope is not extended beyond well defined limits. One thing at least in favor of the electric vehicle is that the makers try to tell the truth about them. All acknowledge that they will not go at fast speed, and that the batteries must be taken care of to get results, while there did not appear to be any disposition to magnify the distance that could be accomplished on a single charge of the battery..A new thing in an engine to run with kerosene, used more like gasoline, was shown, and the engine certainly did revolve. This carriage was the only real departure from accepted styles in the automobile world..As to gasoline engines, I saw several new ones, and it may be just that I am prejudiced, but it struck me that the makers had not taken advantage of their opportunities, for instead of correcting the evils found in the old styles they had introduced new ones of their own invention. In the beginning, the automobile was a substitute for the horse and human locomotion. The new invention was noisy, smelly, a social menace, a novelty, an unnecessary addition to a world that had been getting along quite well by walking if you were poor or riding a horse if you were rich. the rudimentary roads, accustomed to horses and people and wagons, were deadly to the fragile wheels and flat tires were constant. Breakdowns were just as frequent and every driver had to be a mechanic. Who would want such an unpromising contraption when the horse was so ubiquitous and so reliable? Who could have imagined that a hundred years later, the horse would be relegated to the ranch and best seen at the races? But the vision of the horseless carriage was just the first step to the “car.” In his book, The Metallurgic Age: The Victorian Flowering of Invention and Industrial Science, Quentin R. Skrabec, Jr. began with a few well-conceived historical observations. The automobile or horseless carriage, was the final product of the great Victorian engineers. It has been estimated that more than 100,000 patents combined to create the modern automobile. 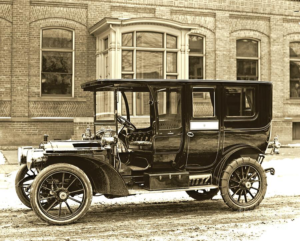 The history of the horseless carriage is one of definitions much as one of technology. It is a history of eliminating mammalian power for locomotion..The slowness of the automobile’s development was not from complexity, but more from lack of a vision or direction..The story of the horseless carriage begins in 1778 with the work of French military engineer Nicholas Joseph Cugnot. To Cugnot is given the honor of the first steam-driven carriage..One day in Paris, Cugnot lost control, and the resulting explosion led it to be banned from the streets. 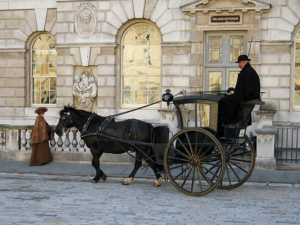 Its provenance from the (horse-drawn) coach was an aesthetic problem for the automobile right from the beginning. By around 1900, the coach had become “old technology;” by contrast, the large-scale technologies needed for ships and aircraft were new and forward-looking. Even the bicycle with its socketed steel tubes and balloon tires represented a more trendy means of transport at the time of then Art Nouveau style..Faster, bigger, further–the Blue Riband for the fastest cruisers, the most luxurious steamers–these all inspired people’s fantasy at the time. Aircraft at this time were still clunky, scarcely clad skeletons, but they soon replaced ships as the icons of technology. This also affected automotive design. From the point of view of formal aesthetics and material technology, the motor car initially took its cues from the boat, because people could not conceive if as having its own form; however the shape was inverted–the pointed bow of the boat became the boat tail, that is the pointed end of the auto body. The change of form until Mercedes Benz had the idea, in 1913, to kink the radiator/its housing and thereby place it dynamically more beneficially to face the airflow. For more than half a century, the automobile’s underlying technology concept relied upon “borrowed identities..”The shape of ships was investigated scientifically; laboratory-based research into fluid mechanics started. But it took quite some time until contemporaries recognized that a car too has to overcome air resistance, and that the function of the body shell is not just to protect the passengers and luggage against the effects of the weather, as as the case with the horse-drawn coach. So, on that spring day, the self-taught practical engineer and commonsense businessman set in stone his visionary plan for the ‘universal car’ that would soon transform personal mobility and, with it, modern society. As he later recalled “I announced one morning, without any pervious warning that in the future, we were going to build only one model was going to be the Model T, and that the chassis would be exactly the same for all cars.” Unquestionably from that point on the Model T, offered in multiple body styles, would be the company’s only product..none of the men with Ford that day..could imagine that 18 years would pass before Ford introduced an all-new model! Henry Ford’s mass produced Model T cars rolled off the new assembly line, pumping out new transportation that everyone could afford. 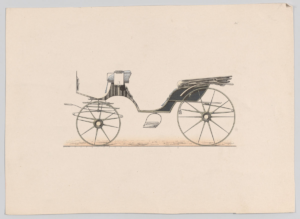 The car followed the basic design established by the carriage–it was vertical and black, but the sheer numbers that were manufactured began to pressure society to respond to the presence of more and more automobiles in its midst. Everything from roads to tires to public safety needed to be rethought and through decades of adjustment, the world finally gave way to the demands of the automobile. One of the interesting consequences of Henry Ford’s revolution in the mass manufacture of automobiles was a concept called “Fordism.” “Fordism” was somewhat like “Taylorism” the invention of Frederick Taylor who broke down the motions of a worker into small units. Taylor sought to make the worker’s process more “rational,” one of the key words of the early twentieth century, and therefore more efficient. Ford, however, introduced the assembly line, or the breaking down of the object itself into multiple units which were then put together by a team of workers on the line. Part of Fordism was the teamwork among the employees who were well paid by their boss, who wanted them to purchase the product itself. Hardly a friend to labor, Ford, nevertheless, knew how to create descendants were the cars of the people of America. But there was an altogether different type of vehicle sharing the road with the familiar black Ford, something we might think of as the High End version of Ford’s little car. The 1914 Ford Model T touring car is shown in this Ford Motor Co. handout. 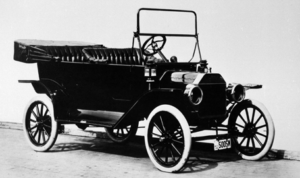 The 1914 model was the first version built on Henry Ford’s moving assembly line. It was in the post-war period that it can be said that there were enough automobiles and enough drivers for certain expectations to have emerged. Consumers understood the intent and limitations of the Ford products and they would expect more of expensive models such as the Rolls-Royce. The post-war Rolls was style heavy and performance light and the company knew that drivers disliked being overtaken by cheaper cars. As Peter Pugh wrote in his book, Rolls-Royce. The Magic of a Name. The First Forty Years of Britain’s Most prestigious Company 1904-1944, “..in 1922 the directors took the decision to invest in a new car..Sales slumped in 1921 and 1922..In 1922 only 430 were sold, less than a quarter overseas..By 1925, the New Phantom (retrospectively called Phantom I when Phantom II was introduced in 1929) was ready. it replaced the Silver Ghost beating its performance and re-establishing Roll-Royce’s lead as the manufacturer of luxury cars..The new model had been prepared with great secrecy, and during its development had been codenamed EAC (Eastern Armoured Car).” The code name referred to an actual Rolls-Royce armoured car manufactured during the Great War and used in the Middle East. This new car impressed Detroit with its ability to run a track at 80 miles per hour. 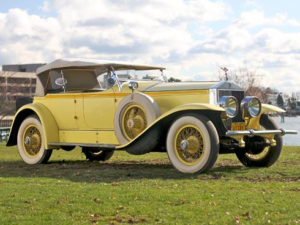 By 1929, there was a new Phantom II with a completely new chassis. By the 1930s, there were clearly demarcated arenas of automotive production: mass production for the ordinary customer and luxury production, deliberately limited and carefully crafted, for a small group of privileged people. The design, however, remained stubbornly fixated upon the “horseless carriage.” Changing the look of the the automobile and re-imagining it into the modern “car,” did not happen in England or America, rather the next changes took place in the East, especially in Germany. What happened in Germany was two-fold, building roads for cheap mass produced cars to drive on and redesigning the cars to recognize the need for an aerodynamic shape. Re-imagining the automobile was a thought process of the 1930s, when everything, every conceivable object, became streamlined. Inspired by the increasing speed of transportation—the fast trains, the fast airplanes, the fast ships, designers began to re-think the car, eliminating the horse at last, and re-imagining in terms of flight. But how did the slow moving car–slow in relation to trains and airplanes–come to be thought of in terms of speed? When I use the word “speed,” I want to make a distinction between the idea of an automobile being faster than a horse and a car that felt like it was flying, zooming through the air, streaking across the countryside. The roads of the 1920s did not allow such driving. Based upon existing paths, the first roads often retraced trails carved out by animals pulling wagons or, in the case of Atlanta, Georgia, followed the paths of cows meandering towards their various barns. These early streets were narrow and crooked, rutted and often unpaved, cluttered with a mixture of vehicles, from wagons to cars, horses and pedestrians. For most people, driving fast was more of a fantasy than a reality, but in Weimar Germany the government decided to build an Autobahn–no horses, no carts, just fast cars. The next post will discuss the invention of the modern car: a dream that would not come true for twenty more years.